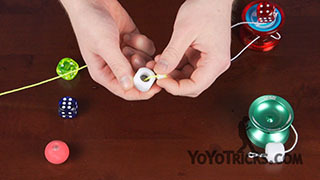 Learn to do the elementary Freehand yoyo trick, known as Bee Sting. So before you learn this trick you are actually going to want to go back and learn the tricks 360 and half bee sting. 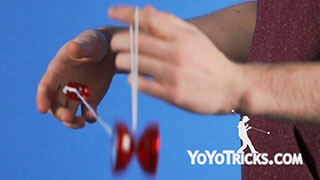 We have videos for both of those on our website. It is really important that you learn those tricks because all that bee sting is just a 360 and a half bee sting put together, but with the catch between the two removed. 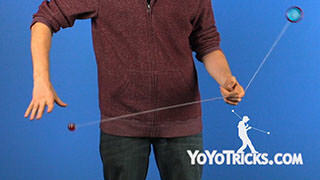 To start bee sting, you are going to want to start in a trapeze, and then you want to check your string proportions. 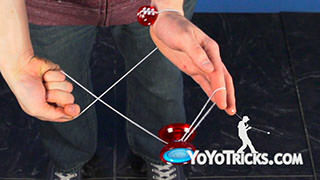 So bring your throwhand up, and if you remember back to our 360 video, you will know that we said that the string above your non throwhand should be about twice as long as the string under your non throwhand, but for bee sting we are actually going to increase those proportions a little bit, so that the string above your non throwhand is about three times as long as the string below your non throwhand. 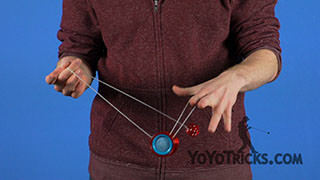 That just gets the yoyo a little bit closer to your non throwhand so the trick will be easier to perform. 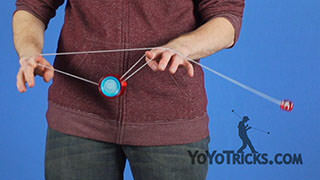 Once your string proportions are correct, you want to perform a 360. 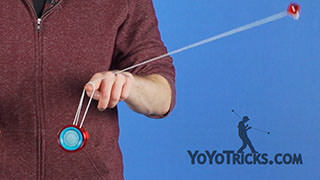 Rather than catching that counterweight, instead, right when the counterweight reaches this point in its arc, right when you would catch it, you are going to stick our your middle finger and hop the yoyo over so the counterweight string can come under and hook under the yoyo just like it would in a half bee sting. So that is 360, stick our your middle finger, half bee sting. 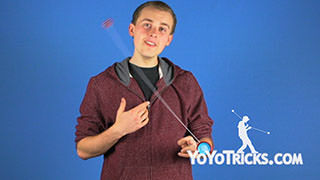 If you want to add a little bit of extra flare to the end of the trick, when you are performing the half bee sting, instead of catching the counterweight, instead you can not catch it and let it continue around and then perform a small clockwise circular motion with your non throwhand. 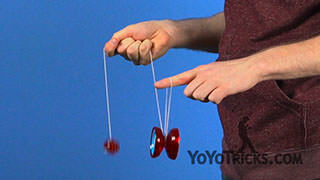 That is going to add an extra revolution to the counterweight and an extra pinwheel to the yoyo. That looks like this. 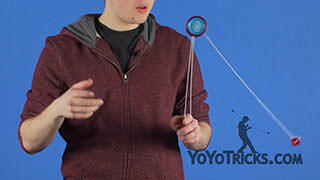 There is that small circular motion, and you will see that the yoyo naturally goes back into a trapeze and then you can go into an undermount to perform a bind. 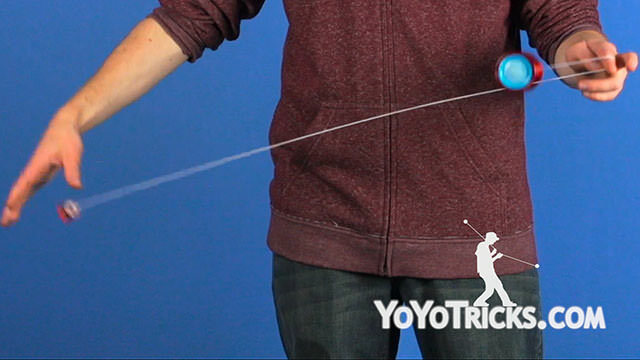 If you are having a hard time learning this trick, there is a couple of tips I have for you. 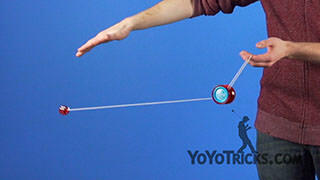 The first is to make sure that when you are first doing that 360, that the yoyo is really close to your non throwhand. 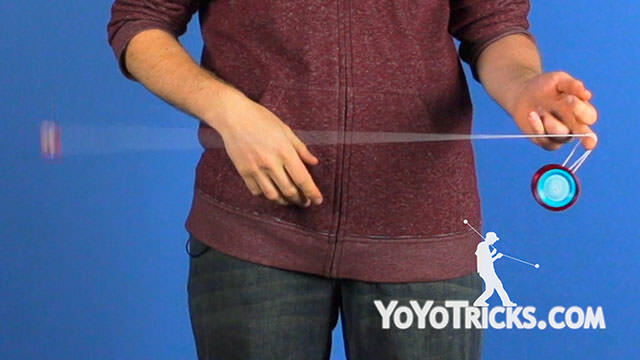 If it is too close to the counterweight and you try to perform the trick, the string proportions are going to make the trick much more difficult to perform. The second tip is because during bee sting you are only ever actually touching the counterweight at the beginning and at the end of the trick, it is really important that right from the get-to, right from the start, that everything is nice and lined up. 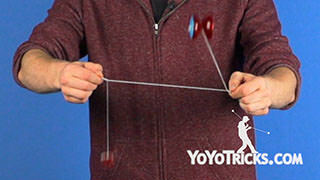 If the counterweight is too far ahead or behind the yoyo, then you are not really able to compensate for that while you are performing the trick. So it is really important that right from that initial 360, that everything is nice and lined up, that makes learning this trick much easier. And that is bee sting.